Previously we demonstrated effective removal of Prymnesium parvum toxicity towards the gill cell line RTgill-Wl by Phoslock™ clay and have since worked on refining clay type and dosage. In this work we explored 12 commercially available Australian clays (two zeolites, four kaolins, six bentonites) and two types of Korean yellow loess for removal of Prymnesium toxicity towards the gill cells under differing pH conditions. At pH 7, gill cell viability improved slightly after treatment with kaolins and zeolites (22- 26% viability increase), with bentonite clays and Phoslock™ performing best (up to 57% viability increase). Korean loess proved unsuitable for removing ichthyotoxins. However, at pH 9, kaolin, loess and zeolite exacerbated ichthyotoxicity and toxin removal by Phoslock TM was significantly reduced (9% viability increase vs. 57% at pH 7). Interestingly, bentonites completely removed Prymnesium ichthyotoxicity at pH 9, thus suggesting their potential as rapid response tools during high density (high pH) fish-killing algal bloom events. 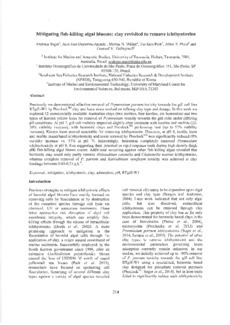 Additional screening against other fish-killing algae revealed that bentonite clay could only partly remove Alexandrium catenella and Chattonella marina ichthyotoxins, whereas complete removal of P. parvum and Karlodinium veneficum toxicity was achieved at clay loadings between 0.05-0.25 g L-1.